Temperate regions of the Northern Hemisphere, ca. 700 species, with 310 in the FSU of which 140 are found in Central Asia, and 80 are endemic. Some species (A. cristophii Trautv. as "Star of Persia"; A. karataviense Regel and A. aflatunense B. Fedtsch.) are known as ornamentals; some are edible. Onion species can be grown for various purposes; many can be recommended as garden plants for the rock garden, natural parks and as cut flowers. Those containing saponins such as A. caspium (Pall.) Bieb. are poisonous. Allium oreophilum C. A. Mey. Caucasus (Dagestan), Central Asia (Dzungaro-Tarbagatay, Pamiro Alay, Tien Shan) and northwestern China. On rocky slopes in the upper mountain zones. Plant 10-25 cm. Bulbs ovoid-globose, up to 2 cm diam., with greyish papery tunics. Leaves 2, linear, ca. 20 cm x 1.-1.5 cm broad. Umbels hemispherical to spherical, loose, 7-8 cm diam., pediceles subequal. Perianth segments broadly campanulate, pink-purple. V - May to September. Fl - mid June to mid July. Fr - July-August. P - by daughter bulbs. Good drainage is necessary, does not tolerate excess watering. 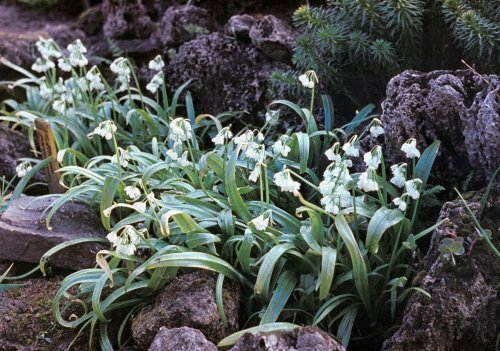 Does well in full sun, can also grow in partial shade. Good for the rock garden, for group planting. Z 4 (3). A. paradoxum (Bieb.) G. Don f.
Caucasus (Dagestan, easern Transcaucaucasus), Central Asia (mountains of Turkmenia) and northern Iran. In shady places in forests. Plant 20-30 cm in high. Bulbs globose, almost 1 cm diam., with grey-black papery tunics. Leaves solitary, linear, arching, ca. 20 cm x 0.5-2.5 cm, keeled, narrowed to base. Umbel with 2 to 10 nodding flowers, frequently with bulblets (up to 20). Perianth segments broadly campanulate, milk-white. V - early spring to beginning of summer. Fl - April-May (for 20 days). Does not produces fruits in zones 3, 4. P - freely by daughter bulbs (3-4 per plant). Prefers partial shade. Very attractive. Flowers resemble those of lily-of-the-valley. Good for the rock garden and spring flower beds. Z 3. New. Central Asia (southwestern Pamiro Alay). In mountains, on rocky places and talus, in shade of rocks and trees. Plant 50-70 cm. Bulbs globose, 1.5-2.5 cm diam., with blackish papery tunics. Leaves 2-3, linear-lanceolate or broadly linear, 1-5 cm broad, much shorter than scape. Umbel spherical, lax, many-flowered, pedicels unequal. Perianth segments rose-violet, with a darker nerve. V - March-April to end June. Fl - May-June for three weeks. Fr - July. P - by seed sown in March or by offsets. Tolerant of partial shade but does better in full sun. Good for group planting and as a cut flower. Z 4 (3). Other ornamental species tested in St. Petersburg and good for zones 3, 4 include: A. altissimum Regel. Western Central Asia. On slopes. 80-170 cm. Large spherical umbel densely many-flowered, pedicels unequal. Flowers violet, pink-violet or lilac-pink, perianth segments with a darker mid nerve. Good for group planting, for the rock garden and as a cut flower. A. barszczewskii Lipsky. Central Asia (Pamiro Alay, Tien Shan). On rocky slopes. 20-60 cm. Umbel hemispherical, flowers large (1.4 cm long), campanulate, pink or pale violet. Recommended for group planting, for the rock garden and as a cut flower. New. A. caeruleum Pall. European part of Russia in Caspian Sea area, Siberia (southwestern regions), Central Asia and northwestern China. 25-95 cm. Leaves triangular in cross section, channeled. Umbel hemispherical to spherical, densely many-flowered. Flowers azure. Good for grouping and as a cut flower, because of the very unusual blue color. A. caesium Schrenk. Western Siberia, Central Asia and northwestern China. On saline soil, in semi-desert. 15-80 cm. Leaves semi-cylindrical, hollow. Umbel hemispherical or spherical, densely many-flowered. Flowers bright blue. Good for group planting and as a cut flower. A. giganteum Regel. Central Asia (southern regions) and Iran. 80-150 cm. Leaves broadly linear, 5-10 cm wide. Umbel spherical, 10-14 cm diam., flowers pale lilac or violet. Good for group planting and as a cut flower. A. pskemense B. Fedtsh. Tien Shan. Talus and slopes. 40-100 cm. Leaves 3, cylindrical, hollow, glaucescent 2-5 cm diam. Flowers white in spherical umbel. Good for dry places and for the rock garden. New. A. ramosum L. Central Asia, Siberia and Far East. In meadows and sandy places. 15-60 cm. Leaves narrow, linear, flowers white in a loose hemispherical umbel. Good for group planting and as a cut flower. A. senescens L. Europe, Siberia, Far East, Mongolia, northern China and Korea. On steppes, in dry and sandy meadows, in forest and rocky slopes. 20-60 cm. Leaves flat, linear-lanceolate. Umbel hemispherical, densely many-flowered. Flowers pink-violet. Well suited for group planting and the rock garden. A. stipitatum Regel. Pamiro Alay. In moist meadows. 60-150 cm. Leaves 4-6, broadly-lanceolate. Umbel spherical, 16-18 cm diam., pedicels sub equal. Flowers pink, very numerous (up to 340-350). Good for group planting and as a cut flower.